Argentina Moto2 & Moto3 qualifying Round-Up: Rabat’s hat-trick and Miller’s Back-to-back poles. It’s early in the season but in both Moto2 and Moto3 riders are starting to appear as title favourites. 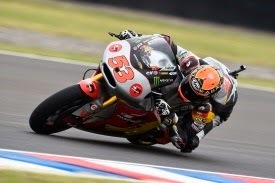 MotoGP’s return to Argentina after a 15 year absence at the all new Autodromo Termas de Rio Hondo saw Jack Miller, winner of the first two races at Qatar and Austin, take his second pole of his career, his first only coming at the last round in Texas. Miller had been quickest in every session over the weekend and continued his dominance in qualifying. The Red Bull KTM rider was luckier with the traffic and passed and slipstreamed his way to the top as all the riders struggled for track position. Class veteran Efren Vazquez used his experience to push for second on the grid for SaxoPrint RTG. The final spot on the front row went to Briton Danny Kent after an excellent performance on the Husqvarna, giving the team their first front row start and his first since returning to Moto3. Jakub Kornfeil took fourth for team Calvo ahead of a back to form Romano Fenati in fifth. Just one place behind him was his team-mate at Sky Racing team VR46, Francesco Bagnaia. Husqvarna had a very positive session with Niklas Ajo in seventh. Joining him on row three are Alex Rins in eighth – easily ahead of his Estrella Galicia team-mate Alex Marquez in eleventh -Livio Loi scored his best qualifying to date ahead of his birthday in ninth. The highest placed Mahindra completed the top ten fastest qualifiers; the CIP of Alessandro Tonucci. Moto2 had been lead by Johann Zarco before the session was red-flagged following a crash for British rider Sam Lowes. The Speed Up rider was spun from his bike, stung by his foot peg and battered and bruised. After the delay the rookie returned to set his best lap of the session on old tyres. He starts 22nd but was just 1.2 seconds off the pace. After the break Caterham’s Zarco initially zipped back into action with his rivals struggling for pace in the final sector. Tito Rabat found his rhythm and pounced late aboard the Marc VDS machine, taking pole with a 1m 43.961, pushing Zarco into second. Xavier Simeon found a little something extra in the closing minutes, with some fast late laps pushing the Belgian into the final front row spot. The second row is home to a trio of talented Moto2 rookies. Maverick Vinales was only demoted to fourth in the closing moments, but can take confidence arriving as the winner of the last round in just his second race since moving up as Moto3 champion. The Spanish rider also set the fastest race lap in both of the previous races. Fifth goes to Jonas Folger, who had been the fastest rider in the practice sessions for AGR. Vinales’ team-mate Luis Salom sits in sixth on the grid for the Pons HP 40 team. In contrast it is Moto2’s more senior riders who take over row three. Italian team-mates Mattia Pasini, whos final laps scored him seventh position, and fellow Forward man Simone Corsi in ninth are joined by Alex De Angelis who sits between them in eighth. Tenth went to Japanese rider Taka Nakagami. Gino Rea struggled for grip and sits in 28th on the grid. Next Next post: Rossi: "We have to work but I have a good feeling"